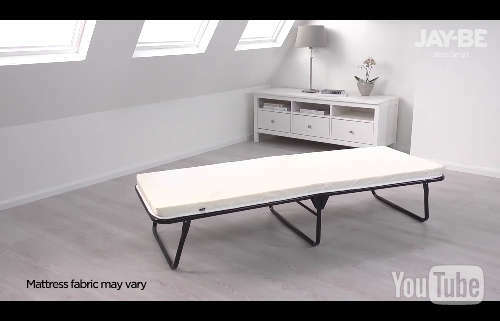 Folding Beds by Jaybe - The Best Guest Beds in The World! Rollaway Beds & Cots with Foam & Spring Mattresses. Welcome to FoldingBed.ca, the prime source of folding beds in Canada! We carry the widest selection of guest beds in Canada, all by an English manufacturer Jay-be. These foldaway beds are recognized around the world for a class of their own. The beds represent a jump beyond the traditional cot, in an effort to provide your guests with utmost comfort while saving you space. This website is run by Mad Beds, the direct wholesale distributor of Jay-be in Canada. We stock hundreds of rollaway beds in the Greater Toronto Area with free shipping virtually everywhere in Canada. We also maintain a showroom in Woodbridge, where you can comfortably try the bed that will suit you best. When you purchase a bed from us you are purchasing directly from the wholesale source and get the best possible price. We invite you to browse our website and watch videos of each bed!